Missouri allows you to complete your divorce without an attorney if you and your spouse can come to an agreement on what to do with your property and how you will care for any children that you have. 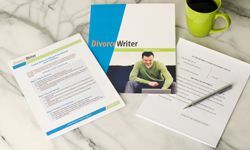 A divorce can be filed in Missouri when one of the parties has been a resident of Missouri, or is a member of the armed services who has been stationed in this Missouri, for 90 days immediately before filing for divorce. A no-fault divorce can be obtained in Missouri if there remains no reasonable likelihood that the marriage can be preserved and that the marriage is irretrievably broken. Complete the Litigant Awareness Program. This mandatory program covers the basics of the Missouri court system and explains the responsibilities of representing yourself in court. The program can be completed by either watching a 25-minute video or by reading the materials, both of which are available online. Then, print a Certificate of Completion. For more information, go to: Missouri Litigant Awareness Program. File for divorce. The divorce can be filed either in the county in which the petitioner resides or in the county in which the respondent resides. DIVORCEWRITER CURRENTLY DOES NOT SUPPORT MISSOURI DIVORCE. Unfortunately, DivorceWriter does not support Missouri divorces at this time. This page may list some free resources that are available for do-it-yourself filers.